Get in the driver’s seat–you control your networking and what events you want to attend. Raise your profile externally-you want to be known in your industry. Raise your profile internally- management love it when you network! You never know who- you never know who you will meet. It could be a great new contact or friend. Most importantly you may have one of those Ahhhhaaaa moments. This is the moment when your potential client or employer tells you about a problem or situation with which you can help. However, before you can get to the Ahhhhaaaa moment you have to break the ice and have a strategy. Take a look at these icebreakers and strategies. “What’s keeping you busy when you’re not at events like this or at work?”This question gives the encouragement necessary for the person to share his/her passions and outside interests. It is an excellent way to add some enthusiasm into a conversation that has hit a lull, especially if he/she would prefer to be doing that activity at that moment. “Are you getting away this summer?” This question can lead to conversations about family, reveal special interests and, if you like talking about travel, it’s a sure-fire way to keep a conversation interesting. While waiting in line for the food, start chatting up the person next to you. This is a great opportunity to get a conversation started because you already have something in common: the food. Everyone is thinking the same thing, What am I going to try? What looks good? Who knows, you might leave the buffet with a better plate of food AND a new contact! That’s a win-win in my book. If you see someone standing alone in the corner, clutching his or her drink, and looking miserable, don’t be afraid to walk up and introduce yourself. Typically, these people need a little help getting the conversation going. If someone is standing alone, he or she is probably feeling uncomfortable or unconfident. If you initiate the conversation, it could make them feel more relaxed and willing to connect. 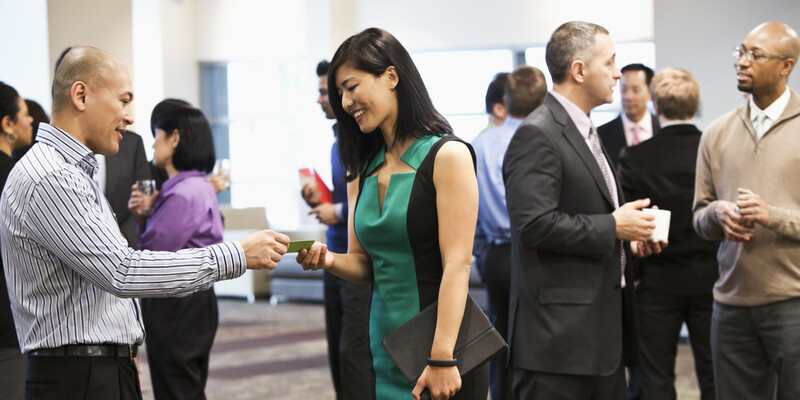 Everyone loves compliments, especially when they are feeling insecure (and many people do feel that way when attending networking events). If you’re struggling to start a conversation with someone, find something to compliment. I know what you’re thinking, Yes, yes, that’s all well and good, but how can I keep the conversation going after the initial question? It’s that time: your drink is dry and you’re ready to move on. When the conversation starts to wind down, don’t try to force more. Remember, you’re there to mix and mingle – don’t chain yourself to one person all night. These are networking tools yo can use in any situation. Remember you are always networking, whether you are at an event or the dog park. DON’T FORGET YOUR CARDS! Download my FREE guide to help you now.